I quite like these posts...let's face it, not every beauty product out there is amazing! I have been storing stuff away and jotting down in my notebook when I have come across products that, for me, were disappointing for some reason and here are my thoughts on 6 products that just are not rocking my world. 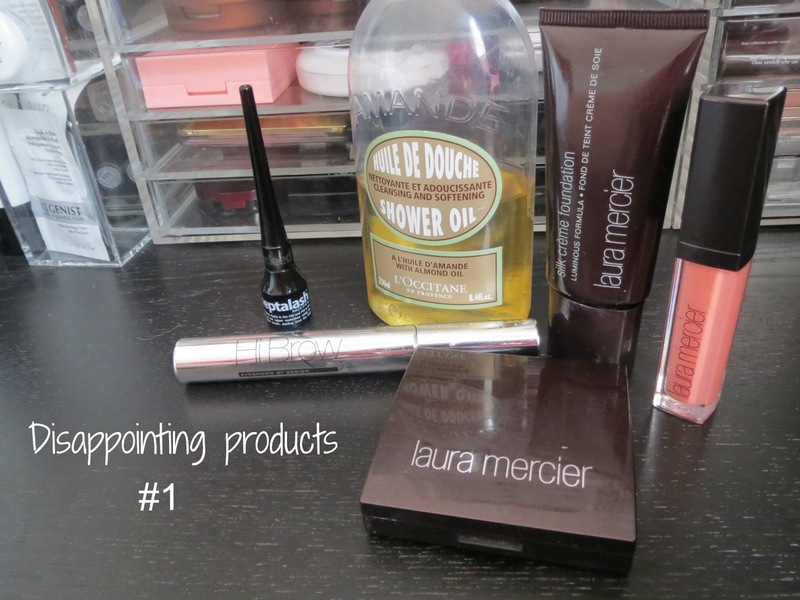 I'll say from the outset, I am quite surprised 3 of the products are from Laura Mercier as it's a brand I thought I quite liked. Usual disclaimer-just because I don't like these products doesn't mean other people don't love them-this is just my own opinion. Two of the products in here I know LOVED by other beauty bloggers on the whole. I blogged earlier in the year here about my love for RapidBrow and Rapidlash. I used to apply them religiously but when they ran out I thought I would try something else so picked up these two products-Peptalash from Indeed Labs (£24.99 from Boots in the UK) for my lashes and Hi Brow Eyebrow Growth serum (£14.99 from beautyexpress.co.uk) for my brows. Now firstly, I was recommended the Eyebrow Growth serum by a beauty salon in Dubai and when I went to pay for it I remember being quite shocked how much it cost (AED350 which is £61) but I didn't want to cause a fuss so just paid for it. Now I realise I have been royally ripped off again in Dubai seeing how much it costs in the UK! The reason I don't like the Peptalash is purely because it makes my eyes sting even though I obviously don't apply it in my eyes! The reason I don't like the Hi Brow is that the plastic wand is SO hard I find it painful and scratchy to use. And because of this I just found I didn't bother to apply it everyday as I had with Rapidbrow and Rapidlash. I've just had false eyelashes and my lashes are now quite short and damaged so I have cracked open another Rapidlash and it's so much nicer to use! Second up is a beauty bloggers fave that I just don't feel lives up to the hype and it's the L'Occitane Amande Shower Oil. The smell is delicious but I find that the product 'sticks' to my skin on contact with water leaving a milky white residue that is difficult to remove. I will no doubt use it all but I expected to fly through this bottle but in reality this has been in my shower since January and every time I use it I am disappointed. Having said that I am currently using the dry body oil from the same range and do really like that. I won't repeat myself but I blogged about my experience with the Silk Creme foundation here. I just could not get it to work for my skin type whatever I did-and I tried everything! The Smooth Focus Pressed Setting Powder was just horrendous-the fall out when trying to apply it from the palette was awful as you can see here-it literally goes everywhere! One dip of my kabuki brush in the powder! When applied on the skin it just gave a ghostly white cast and just didn't seem to blend at all. The only way I could get it to work was to use the Real Techniques multi task brush, dip it lightly in the powder, push the brush bristles down on the back of my hand to 'push' the product down the brush shaft and then lightly tap and roll the brush on my skin. Far far too much hassle!! I did use it all as it was expensive but I will definitely not repurchase! Finally the Lip Glace. Don't get me wrong, the formula on this is pretty damn perfect. If you hate your lip gloss being sticky then Lip Glace's are for you because they feel like water on your lips. I also like the colour of this lip gloss, what I HATE is that it settles into every single line on your lips and within minutes looks like a milky mess. You can kind of see it already seperating in the picture below and this was literally within seconds of applying it. I will probably try this on top of a lipstick in future rather than gloss on it's own. Have you tried any of these products and loved them? What products aren't floating your boat at the moment?